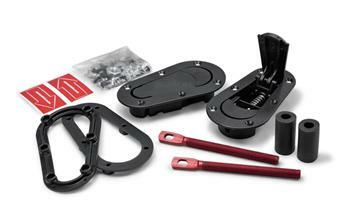 SEIBON AeroCatch Hood Latches UNIVERSAL - Dezod Motorsports Inc - Home of the automotive performance enthusiast since 2002. Seibon Carbon is proud to announce its collaboration with AeroCatch on special edition 120 Series panel fasteners. Special edition panel fasteners feature exclusive packaging design that includes Seibon Carbon’s iconic Nissan GTR and company colors. This collaboration comes to no surprise as both companies specialize in the manufacture of high-performance parts that go hand-in-hand. “Seibon Carbon is honored to work with AeroCatch on this special project. We’ve been long time, proud supporters of AeroCatch panel fasteners because of their aerodynamic style, high-strength construction, and discrete design. We are proud to offer top-quality products to our customers. More importantly, products that we believe in.” – Seibon Carbon. Panel fasteners are designed for hoods, trunks, and tailgates. AeroCatch products are independently tested in an UK testing house to ensure maximum safety levels are achieved; making them suitable for professional motor racing, rally, and street.